Solar activity monitoring is set to improve dramatically, and updates come right to your phone with the free 3D Sun app. Energy from the sun makes its 93 million-mile way to Earth in about eight minutes. When the sun acts up, kicking off violent bursts of electromagnetic energy, the effects can take the form of an awe-inspiring display of the aurora, or they can cause dropped calls on your cell phone. In a pair of fresh developments, scientific innovations are improving our ability to monitor and predict such solar outbursts, and this information is now available in the palm of our hands. MSNBC reports that a new solar activity monitoring technique can collect and analyze subtle acoustic cues given off by the movement of the sun's liquid and magnetized core. This development should dramatically improve the prediction of solar flares, which we generally haven't been able to do before. And the innovation is well timed, owing to 2010 roughly coinciding with an expected uptick in solar movement per our home star's 11-year cycle of activity. Further, as Wired reports, NASA has released a free iPhone application called 3D Sun that allows users to keep tabs on solar goings-on. Relying upon data collected by NASA's pair of STEREO satellites that monitor the sun from two different points in space, NASA's data stream features coverage of nearly 90 percent of the sun's surface activity. 3D Sun users can track sun spots as they develop and evolve, watch solar flares in real time and receive solar news updates from a PhD-level astrophysicist in the event of major and noteworthy solar occurrence. And, if you live near the North Pole, 3D Sun will give an indicator that it's a perfect night to step outside and feast your eyes on that positive effect of solar outbursts, the Northern Lights. HAMPTON, Va., Dec. 16 /PRNewswire-USNewswire/ -- New measurements from a NASA satellite show a dramatic cooling in the upper atmosphere that correlates with the declining phase of the current solar cycle. For the first time, researchers can show a timely link between the Sun and the climate of Earth's thermosphere, the region above 100 km, an essential step in making accurate predictions of climate change in the high atmosphere. Scientists from NASA's Langley Research Center and Hampton University in Hampton, Va., and the National Center for Atmospheric Research in Boulder, Colo., will present these results at the fall meeting of the American Geophysical Union in San Francisco from Dec. 14 to 18. Earth's thermosphere and mesosphere have been the least explored regions of the atmosphere. The NASA Thermosphere-Ionosphere-Mesosphere Energetics and Dynamics (TIMED) mission was developed to explore the Earth's atmosphere above 60 km altitude and was launched in December 2001. One of four instruments on the TIMED mission, the Sounding of the Atmosphere using Broadband Emission Radiometry (SABER) instrument, was specifically designed to measure the energy budget of the mesosphere and lower thermosphere. 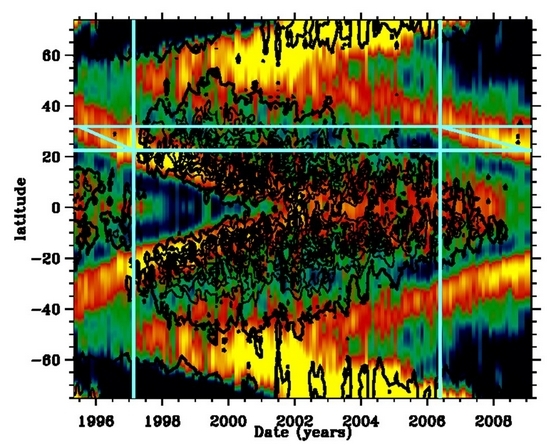 The SABER dataset now covers eight years of data and has already provided some basic insight into the heat budget of the thermosphere on a variety of timescales. There apparently is a great deal of interest in celestial bodies, and their locations and trajectories at the end of the calendar year 2012. Now, I for one love a good book or movie as much as the next guy. But the stuff flying around through cyberspace, TV and the movies is not based on science. There is even a fake NASA news release out there… So here is the scientific reality on the celestial happenings in the year 2012. Nibiru, a purported large object headed toward Earth, simply put - does not exist. There is no credible evidence - telescopic or otherwise - for this object's existence. There is also no evidence of any kind for its gravitational affects upon bodies in our solar system. I do however like the name Nibiru. If I ever get a pet goldflish (and I just may do that sometime in early 2013), Nibiru will be at the top of my list.